I am sure there are many things going on in the world today. 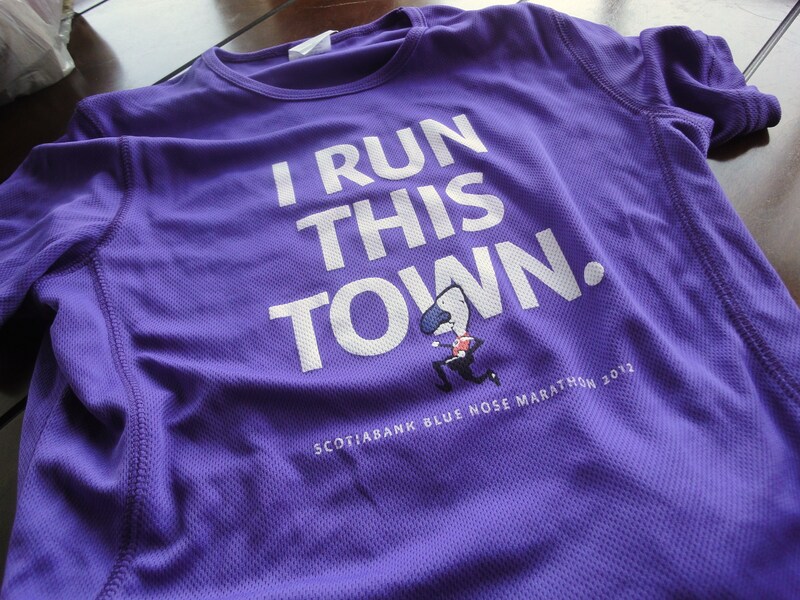 All I can think of is that start line tomorrow morning, around 8:10, on Sackville Street in Halifax, Nova Scotia. For the first time, it’s a start line that has nothing to do with agility. I will be completely alone, no Shiva by my side to make people laugh and hide my mistakes. Amazingly, I have reached my goal of $500 for the Nova Scotia SPCA. (Check out the thermometer!Oh how it glitters!) That alone makes any injury I may sustain worthwhile. I’ve never fundraised for a personal event like this before and never expected success. It’s all thanks to the support of friends, family, and my fellow blogging animal lovers. Seriously. I can’t thank you enough. It means so much to me personally that you would donate your hard-earned money for the animals of Nova Scotia. I don’t want to get all mushy, but a very special thanks goes to Pamela of Something Wagging This Way Comes for spreading the word on her blog and Facebook page. Your encouragement has touched me more than I could ever articulate. I also want to publicly thank my PH who not only put up with my whining during my ankle problems, but supported the crazy venture wholeheartedly. 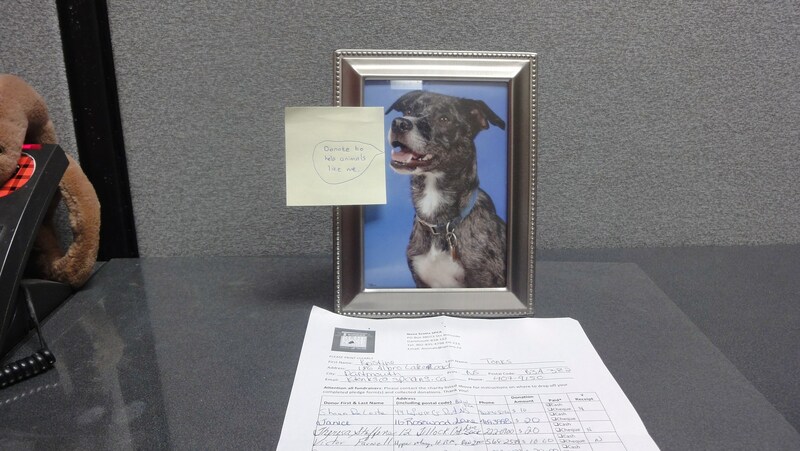 He even set up a little donation station on his desk at work and gathered $125 from his co-workers for the cause. Thanks go to everyone who donated and who sent out words of cheer. No matter how fast I am tomorrow, or if I end up hobbling across the finish line, knowing you are rooting me on makes all the difference. Pet-lovers of the blogosphere, this run’s for you. Yay Christine. My dad said that I could race you later if you want. Good Luck Kristine!!! Have fun! Hooray! Have fun tomorrow! And good luck! Drink water, breathe, have fun!! Good luck! You’ll do AWESOME! YAY! Good luck, and have a great time, Kristine! Good luck and remember we are all rooting for you!! Joining this event is really an awesome experience. This is the way for you can measure your body capacity in running. I know you can do it. Best of luck to you!! You will do great no matter what! I wish your success at the race of tomorrow morning. I hope you will be the winner. Go fast, run fast and be the winner. Good Luck. Congrats on the fundraising! Hope the race is great! Yay, Kristine! I was so thrilled to see your finish time on Facebook yesterday! Congratulations! And great job surpassing your fundraising goal. But do tell: were you able to jog up that scary-*ss hill? Or did you walk? And if you go back there for K9 Kamp, how many times will Shiva run up and down while she waits for a mere mortal to make it to the top? If the system restore feature will not let you go back to later dates in “system tools,” it could be that your anti-virus system is blocking the system restore feature–which can happen with antivirus programs such as Norton Antivirus..
Just heard the good news from Jodistone! Congratulations on making it through the 5K with that ankle! Lots of Woofs and Licks and tail wags for all the help for the dogs at the Nova Scotia SPCA!!! Bet your keeping that ankle well iced! Can’t wait to hear how you did!! Congratulations!! YOU’RE GOING TO DO GREAT! Can’t wait to hear how it goes! That’s awesome that you reached your fundraising goal and then some. Congrats! I am waaaay behind, but I heard you did awesome, despite your ankle injury. Congrats!